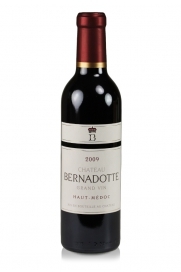 Château Bernadotte is a wine producing estate in the Haut-Médoc appellation of Bordeaux, nestled along the left bank of the Gironde estuary, situated in the commune of Saint Sauveur which shares its eastern border with that of the extremely well-known wine commune of Pauillac. Château Bernadotte was built in 1860 and in 1998, a year after its acquisition by Madame de Lencquesaing who also owned the famed 2nd. classed growth (Deuxième Grand Cru Classé) Château Pichon Longueville Comtesse de Lalande in Pauillac, a complete rejuvenation of the estate was started. This included the winery, the chai (vat storage room), the cellars as well as the château itself. Following a study of the soils in the vineyard a large-scale replanting took place and the proportion of Merlot vines was increased to 44%. The installation of twenty three thermo-regulated fermentation vats allowed for precise control of the wine-making process and the increased number of vats meant that distinct parcels of vines could be vinified separately which ensured greater control and flexibility over the final blend. In 2007 Madame de Lencquesaing sold her wine estates including Château Bernadotte as well as Château Pichon Longueville Comtesse de Lalande and two properties in the appellation of St. Estephe, namely Château de Pez which was awarded Cru Bourgeois Exceptionel in the 2003 re-classification and Château Haut Beauséjour, another Cru Bourgeois property, to the Champagne house of Louis Roederer. 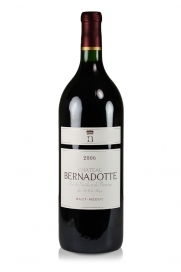 It is widely accepted that subsequently under the direction of Frédéric Rouzaud the wines of Château Bernadotte showed an improvement in finesse and overall quality. A new chapter in the château's history was begun in December 2012 when it was again sold, this time to the Asian drinks, food and property giant the King Power Group who clearly see the purchase as an important strategic addition to its portfolio at a time when the most rapidly expanding market for fine wines is in the Far East, especially in China. The vineyards of Ch. Bernadotte comprise a total of 35 hectares on land surrounding the château. The soils are a well-drained mixture of sandy gravel with a layer of clay at some depth. This geology encourages a moderate degree of vine stress prior to the grape harvest as the roots must search for the moisture contained within the layers of clay. Following the soil and sub-soil analysis carried out in the wake of the 1997 sale the parcels were re-planted with 50% Cabernet Sauvignon, 44% Merlot, 4% Cabernet Franc and, finally, 2% Petit Verdot. The percentage of Merlot was increased to provide extra fruitiness and a higher degree of suppleness to the blend. The Cabernet Sauvignon lends structure and body enabling the wine to age better. The Cabernet Franc and Petit Verdot together bring a hint of freshness while also contributing to the overall complexity of the final blend. The average age of the vines is in excess of twenty five years and the planting density is 6500 per hectare which serves to force the vines to compete and restricts the yield of grapes that each vine produces. The traditional process of making the wine each year starts in the vineyard where a team of seventy five pickers harvest each parcel by hand and the grapes are sorted and selected there and then ensuring that only grapes destined for crushing enter the winery. Once at the winery the bunches are placed on a conveyor belt which carries them along to a crusher/de-stemming machine before the harvest of each parcel is air-blown into one of twenty three temperature-controlled stainless steel fermentation tanks where a gentle extraction process occurs and vinification is begun. The wine is aged in French oak for a period of between a year to a year and a half depending on the attributes of the particular vintage with approximately 30% going into new oak barrels. Eleven thousand cases (131,000 bottles) are produced each vintage. Château Bernadotte AOC Haut-Medoc rouge is vinified in the traditional Bordeaux manner with the aid of modern technology. This means that the wine the consumer gets in the bottle is a classic Bordeaux red but made with controlled precision removing the uncertainty of hygiene and wine-making faults. Rigorous selection of the parcels and the blend of four grape varieties enables a consistent house style notwithstanding the character of each vintage. 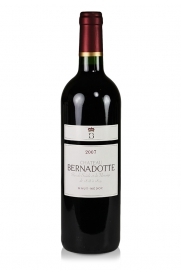 Château Bernadotte combines a fruity suppleness with a firm tannic structure offering good ageing potential thus allowing the wine to develop well in suitable storage conditions. 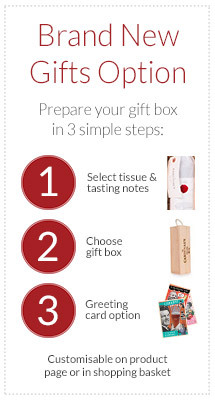 The nose is typically one of red berries and blackcurrant with tobacco and cedarwood notes. The mouth-feel is quite elegant and light yet with good fruit concentration. It is usually ready to drink at about three years old and can carry on developing and drinking well for ten years or even more in very good vintages. Good with roast meats especially beef and lamb dishes. Try pairing it with an entrecôte steak with Bordelaise sauce. A second wine is also produced which is called Château Fournas Bernadotte. Some of the vineyard belonging to Bernadotte actually lies over the border in the neighbouring commune of Pauillac and, somewhat paradoxically, the soils in this plot are considered inferior to the bulk of the plots and the grapes grown here always find their way into this second wine along with other de-selected parcels. There are around 6700 cases (80,400 bottles) of Château Fournas Bernadotte produced each year. It lacks the structure and richness of the first wine but provides a softer, fruity Bordeaux red for earlier drinking. A cru bourgeois wine made in the Haut-Médoc from roughly equal proportions of Cabernet Sauvignon and Merlot. Robert Parker is a fan. Robert Parker described it as the best wine to date from this estate and requiring a little more time to evolve. Classic red Bordeaux in a magnum that is very nice now and which has at least another 10 years of good drinking.